Winner of ‘Scottish Small Hotel of the Year 2008’, this luxury hotel is set in 6 acres of parkland, one mile from the Solway with its sandy bays and coastal walks. Cavens offers large, elegant en suite bedrooms featuring free tea/coffee, fresh fruit and local biscuits. Some rooms have private sitting rooms with wonderful views of the Solway Coast. Cavens Restaurant has daily-changing menus featuring fresh local produce. The excellent wine list complements the seasonal Scottish menus. Cavens Restaurant With Rooms has vast sitting rooms with open fires, where guests can have drinks before and after dinner. 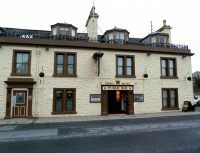 The hotel is personally run by its resident owner Angus Fordyce. 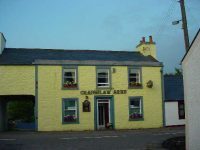 The Steam Packet Hotel in the Isle of Whithorn is situated on the quayside of a picturesque little fishing village right down on the very tip of the south west peninsula of Scotland. The ‘Packet’ is renowned for its food with an extensive menu served in either bar, lower dinning room or conservatory. 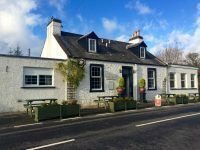 The specials menu is changed twice daily and focuses on making use of the best available, local, Scottish produce through the seasons. Unsurprisingly, we specialise in seafood; taking advantage of what the local boats can provide. Lobster, crab, sole and monkfish are just some of the dishes regularly served here. 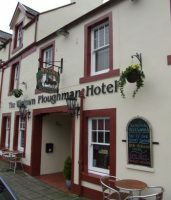 A comfortable Dumfries hotel next to Easterbrook Hall, with an all-day restaurant and lounge bar. Your hosts, Steve, Sarah, Rory, Campbell and the rest of the team look forward to offering you a warm welcome and comfortable stay. Sits on the quayside overlooking the harbour. 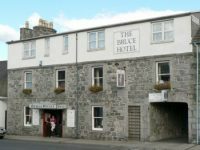 Personally run by the Scoular family for over 20 years, the hotel is the perfect place to escape from the pressures of modern living. Seven ensuite bedrooms, five with sea view. Our new deluxe rooms have power showers, luxury handmade beds and seating areas overlooking the harbour. 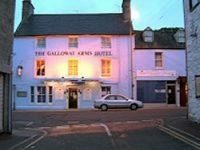 Tea and coffee facilities, TV and phones are all standard.Our famous Galloway breakfast is included in the tariff. 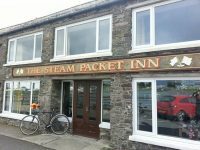 The Steam Packet Inn provides for anything from a quick bite of lunch through to a full evening dinner. Meals are served throughout both bars and in the lower dining room and conservatory restaurants. 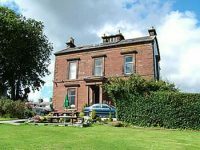 Kirroughtree House Hotel is a Listed Country Mansion dating back to the 1700’s set within 6 acres of its own gardens only minutes from the country town of Newton Stewart and the River Cree. 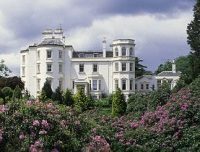 Relax in the quiet of the countryside and the ambience of the Hotel, or enjoy outdoor pursuits of your choosing in the beautiful surroundings of South West Scotland. Bookings can be made for various Golf Courses in the area – the Newton Stewart Golf Club (golf buggies available) only a short stroll away. In the adjacent Galloway Hills the deer roam free and are often seen in the gardens. The hills are a magnificent environment for walking and cycling and with the relatively mild climate of the South West at any time of the year. Beautiful Gardens, picturesque ports, castles and other historic sights are close by. Hunting and fishing are also available for those so inclined. 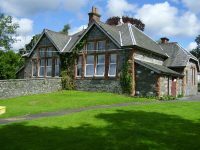 Kirroughtree House is situated only 8 miles from Wigtown with the main driveway access being from the A714 just 300 yards from it’s junction with the A75.